Unganing and Hatayanga had to travel deep into the bush to dig out wild yams for their hungry families. Drought was gripping the country and the normally prolific gardens were bare. Even with this pressing need to find food for their families, Unganing and Hatayanga responded to an even greater need: the need for spiritual food in their heart language. For 19 years, Unganing and Hatayanga have been helping with the translation of the Scriputres into their language of Mato. They knew Scot Stober was traveling from the United States to meet them to draft about half the remaining books in the New Testament. Leaving their families wasn’t the only challenge they faced. Boat troubles delayed them and they had to spend several nights in another village praying about what to do. 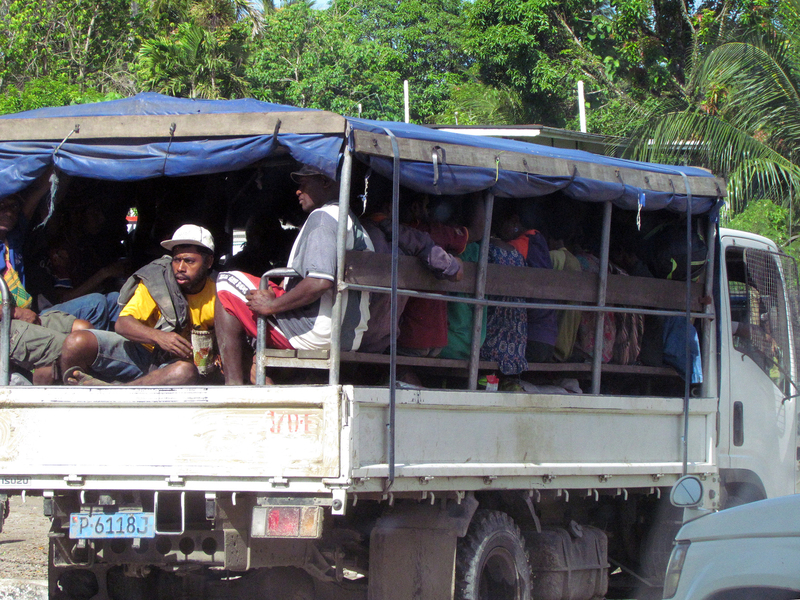 Finally they were able to make the trip by boat to the neighboring provincial capital, only to find out the Public Motor Vehicles weren’t transporting people to where Scot was waiting in the port city of Lae, due to street protests going on there. Thankfully, the upheaval quieted down sufficiently for buses to get through and they arrived in Lae, nearly a week overdue. God abundantly blessed their sacrifice and commitment and they were able to make tremendous progress on the translation in the time that they had. Though street protests continued in the city around them, they were in a safe place and able to work in relative peace. Not only were they able to reach their goal of drafting 11 books, they also revised four other books and updated the glossary! This included going back to the earliest chapters they had translated and bringing them up to date with key terms and making some subtle grammatical improvements. As a result, the entire New Testament is now in draft form or better. Four weeks later, Scot, Unganing and Hatayanga returned to their families, grateful to have had a part in bringing the Mato New Testament a bit closer to completion. They look forward to the day when they can meet again to continue the work. Each one is committed to doing his part to get the complete Mato New Testament into the hands of the people. This video depicts one of the many stories surrounding the recent Kuni New Testament dedication in PNG. We celebrate with the many, many people who were involved in making this translation happen.